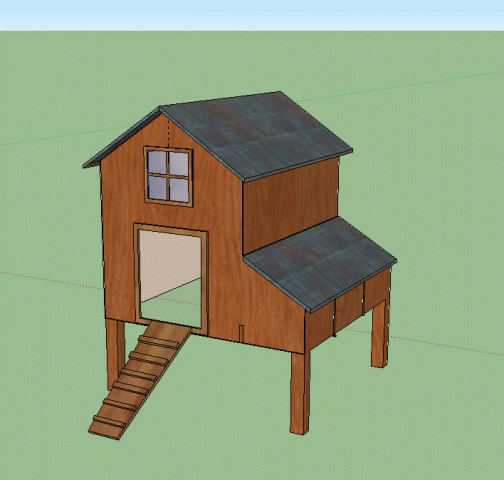 When I was designing our coop, I used the pictures of all the coops here for ideas, so I thought I'd show how our turns out to give other people a few ideas! 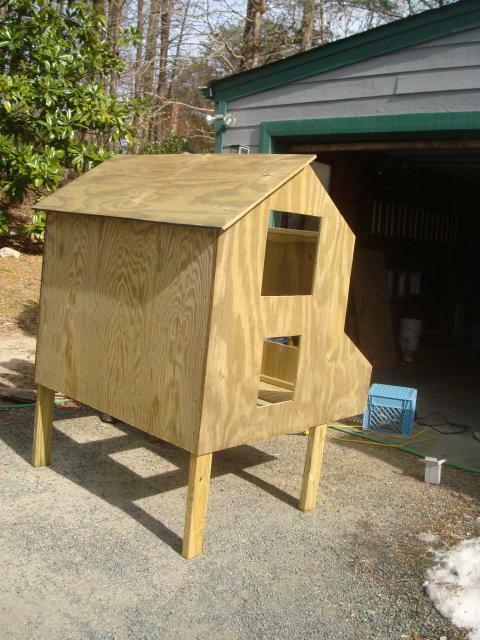 We wanted to build our small coop for not more than 6 hens...and we don't have too much carpentry experience, but I think it turned out quite well, all things considered. We planned on building them a larger permanent run, as we want them to have space to stretch their wings, and there are too many dogs in our area for unsupervised free-ranging. So, here goes! First, the plans. 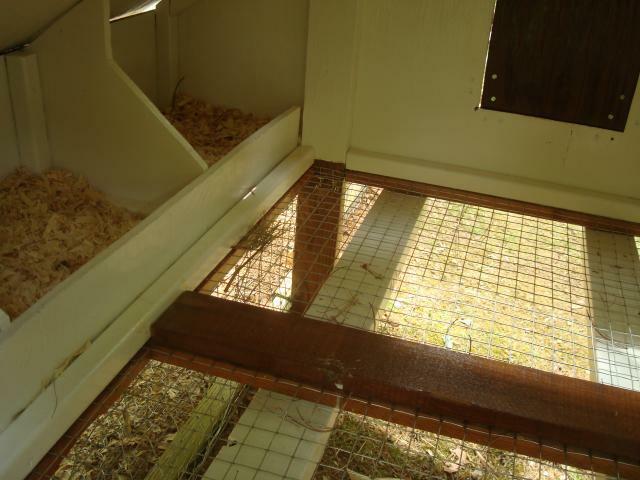 The basic coop design is 4' x 3', with nest boxes stretching the length of one side, 12" deep, so really it's 4' x 4'. 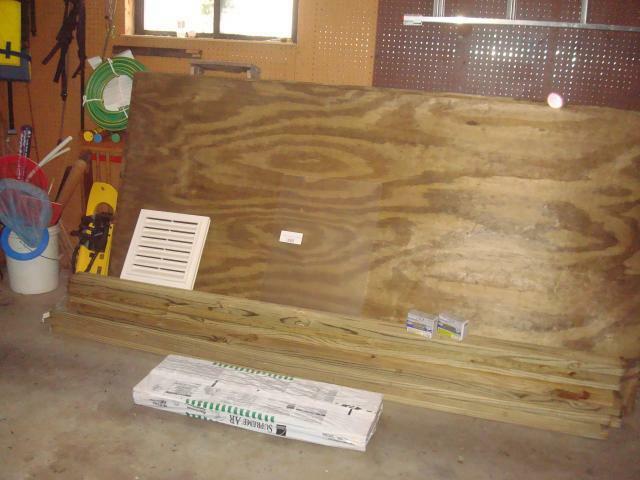 This makes it very convenient for buying 4' x 8' lumber pieces. 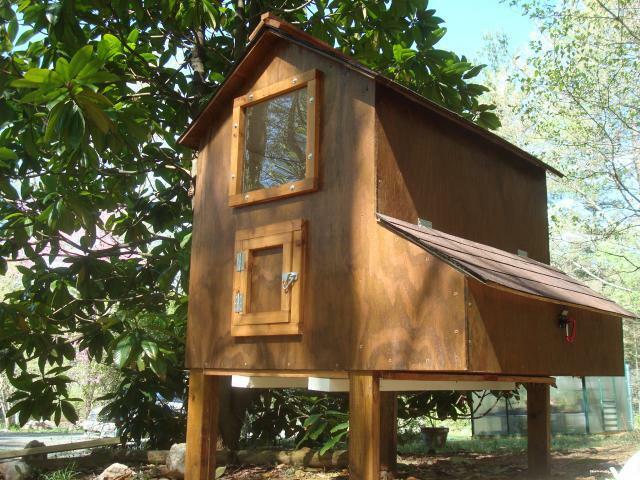 It's raised 1.5' off the ground, and the structure itself is 3' high on the sides, 4.5' high at the apex of the roof. 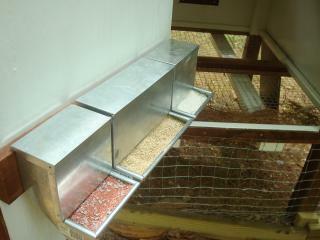 2) We made the chicken door smaller, so that the rain or cold would get in less when it was open. 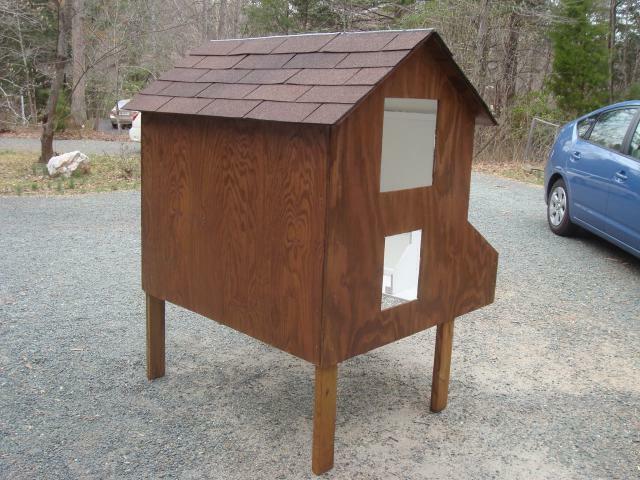 It is now 9" x 12", 6" up from the base of the coop so the bedding doesn't spill. Then, we went to Lowe's. I'll make a list of all the materials we used, even though if took...1...2...3...4...6 trips as we realized we needed more of this or that or the other. 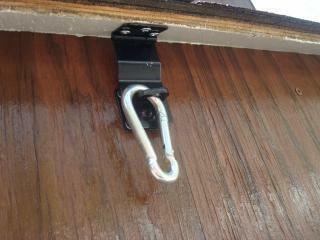 3 secure latches: 1 for back (service) door, 1 for nest boxes, 1 for chicken door. 1 12x12" prefab "gable vent"
I would guess that all those materials cost on the order of $500. If we'd gotten more of the material secondhand, it would have been a lot less. We did not make that much waste, however; used the most of what we got. You can see what I meant by pre-fab gable vent...In retrospect, it would have been similarly easy to just cover an opening with hardware cloth right under the eaves. We have reached the three-dimensional stage! We are (you may notice) building it in our driveway with the idea that at the end it will still be light enough to carry it where it needs to go. The left hand side (in the picture) will have the chicken door with the window above it. The other side will have the service entrance with the vent above that. 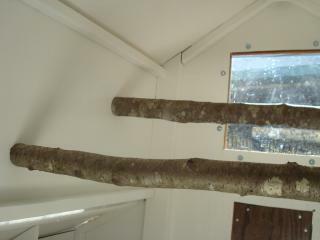 One half of the roof goes on, as well as the nest box floor and two parts of the far wall! 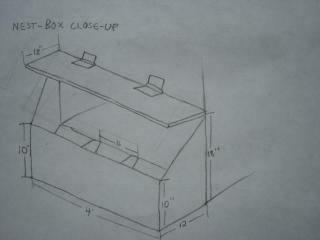 The nest boxes will have a "lip" as well, we just haven't installed it yet. We are leaving the floor for last, as it will be wire, and it's much easier to work inside the coop when you can stand inside of it. 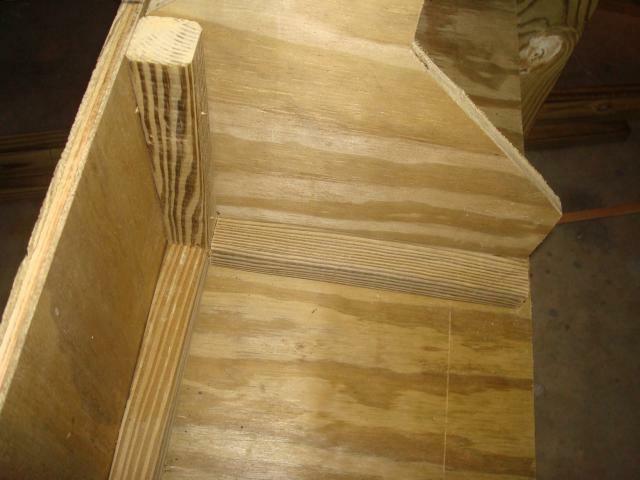 All the plywood, 2x2s and 2x4s that we have been using are treated lumber, and we don't want the chemicals to get to the little chickies. So, we're going to paint the inside of the coop white. It will make it brighter in there for them, too. 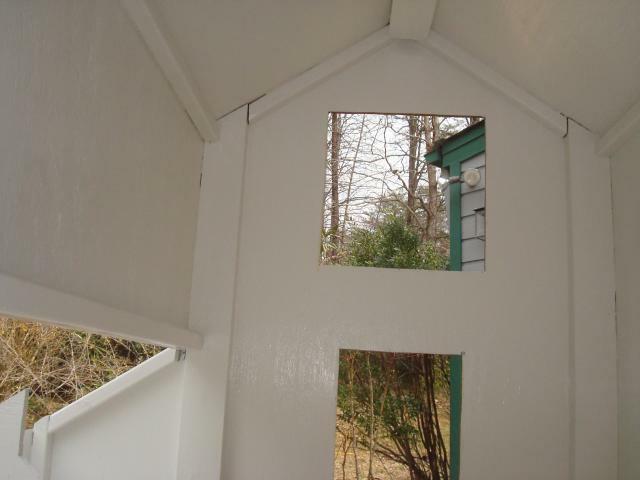 Here's a picture of the inside of the coop: the same, but painted. 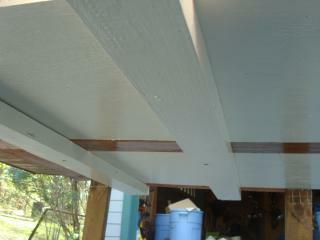 We used two coats of stain on the outside to cover up the greenish color of the treated wood. 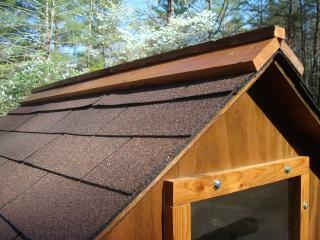 We also used two coats of polyurethane, to make it shiny and give it more protection from the elements. 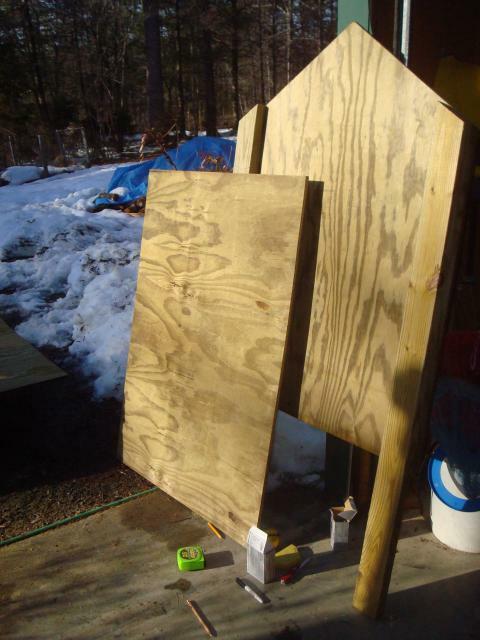 We did not use tar-paper, owing to the small size of the structure, and used regular staple-gun staples instead of nails because we did not want them to poke through. Attaching shingles to the peak of the roof was kiind of awkward, so we are going to instal a wooden roof cap made from the trim wood. 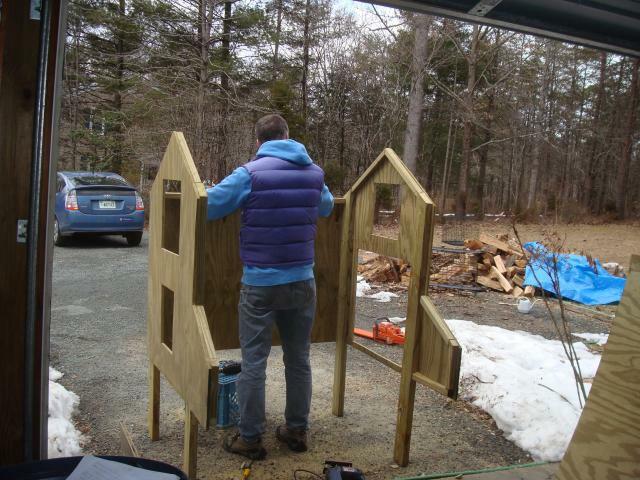 We only put one coat of stain on the cedar trim, to set it off from the rest of the coop. It has two coats of polyurethane like everything else, and looks quite nice! 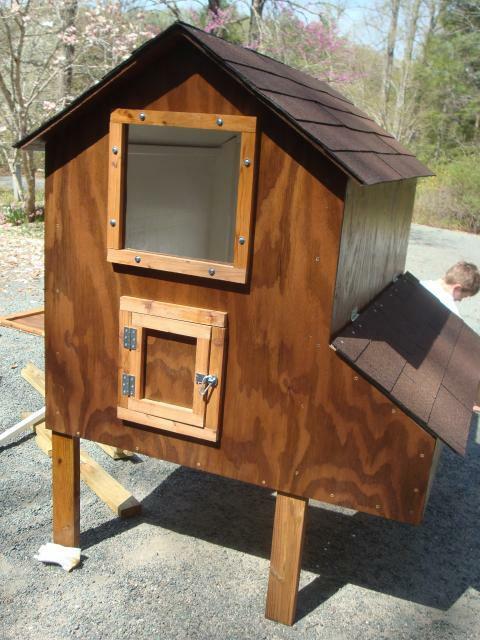 Here's the next picture: we've made quite a few improvements: installed the nest box hinging roof, the trim on the front, the window, and the front door! In the winter when the floorboards are on with bedding, all we have to do is slide them out and most of the bedding will fall through! That's the idea, at least. 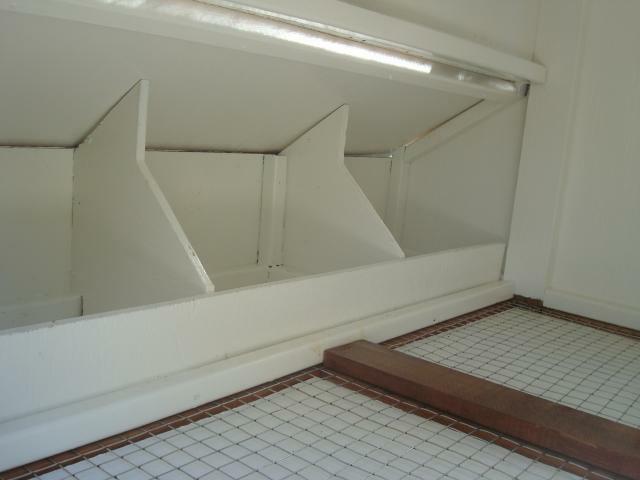 We also put hardware cloth on the inside over the vent opening for extra protection. So... now, on to the run!! 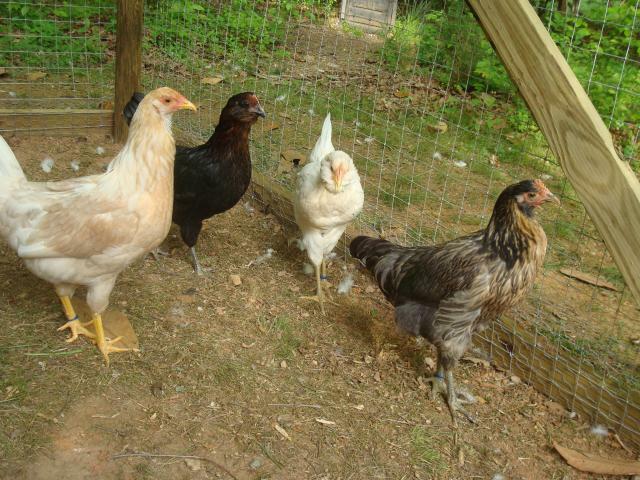 Left to right, it's Pippin, Griffin, Lizzy, and Nutmeg. Chicken Coop Tour movie!!! Starring...chickens listed above! Glad if I've given anyone any ideas! Nest boxes definitely didn't have to be that big...the end up mostly shoving the hay in one corner. "Good plans and plenty of pics"
Where did you find that nest box latch? I need that! Amazing, functional, and beautiful all in one! Nice job! This was my inspiration for a coop. it almost looks exactly like it! My son built your design for our small flock and I love it. 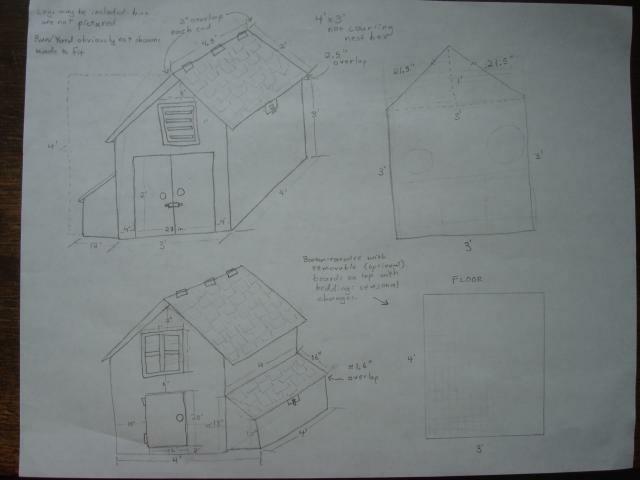 He was 16 and really wanted to earn some spending money so offered to build a coop and this is the plan he used. It is gorgeous. Thank you for putting such clear information out for people to build such a wonderful coop. 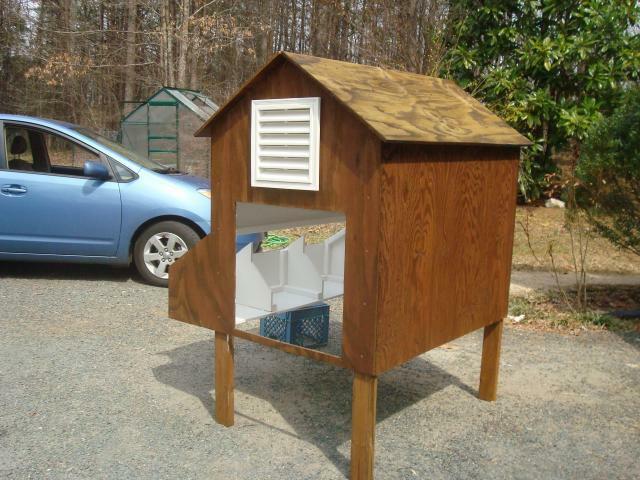 so im just wondering how many chickens you have in this coop? 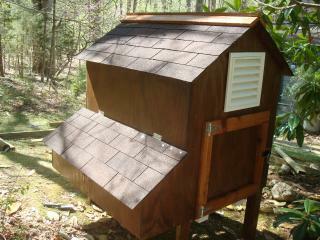 i have six hens, and planning on making a new coop is on my spring to do list. your design is what i've beeen thinking about, im just trying to figure how much square footage i should make it for my six girls! Well, I suppose that would help a lot, although it would make the construction a bit more complicated. What I actually had in mind was maybe cutting a skinny rectangular "window" with just wire and a wooden shutter on either wall, high up near the perches to allow for more air-flow. Anyway, either the vent is situated in the wrong place in the coop, or the screen gets clogged up with dust, or something...at any rate, it can get pretty stinky. Glad you like it! When you say you need more ventilation, is that because your window doesn't open? I really like your design and have been focusing on it. I didn't even have many things I wanted to change except for making the window open and close.